When you're an ACTIVE customer, you get advantages that give your endurance event marketing a leg up on the competition. Your free event listing will live in ACTIVE.com's searchable calendar, which is visited by millions of active people searching for things to do every day. But it doesn't stop there – using our online race registration software gives your endurance event a boost. Each page on ACTIVE.com features "Activities Near You" event recommendations, which only include events that use our online registration platform. 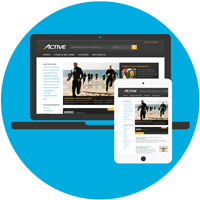 This free, prominent placement throughout ACTIVE.com will get your event seen by millions of site visitors. Pacticipants are able to "like" and "share" your event when they register, promoting your event on ACTIVE.com as well as their chosen social media channels such as Facebook or Twitter. More and more people are using their mobile devices to view, search, and transact. The good news is that ACTIVE.com is mobile-optimised, so our event listings can be easily viewed from a mobile device. Millions of visitors come to ACTIVE.com each month, which means that Google knows we're popular with fitness-minded people and consistently ranks our events within the top search results. That gives you more web "real estate" because your website, as well as your ACTIVE.com listing, will appear on any internet search result for your event.